To be released soon on the VV label will be their fourth release entitled "Closing Strong!" featuring both the complete live soundboard recording from February 23th 1970 Las Vegas Closing show and the complete live audience recording from Houston on March 01, 1970 Afternoon Show . After the success of the first three releases We decided: first to improve the product and second, keeping the same formula to give you more.….. The producers are aware of the fact that the closing night show, as one of the best Elvis Presley concerts ever, has been previously released in different imports. But Here we give you the chance to listen to the show in its entirety FOR THE FIRST TIME in a double high valued collector vinyl set. The second show, the Houston incredible March 1st afternoon show, presents Elvis at the pick of his possibility, although not new to CD collectors, will not have been heard in this quality before. This release is taken directly from a first generation tape and has been professionally remastered to a high standard producing an excellent audio quality, The sound quality is far superior to the previous released audience recordings. Ask your local dealer for samples! . Elvis at Houston is pure dynamite , delivering a great performance that compares with the Closing night in terms of quality, giving to this release the status of “UNIQUE”. 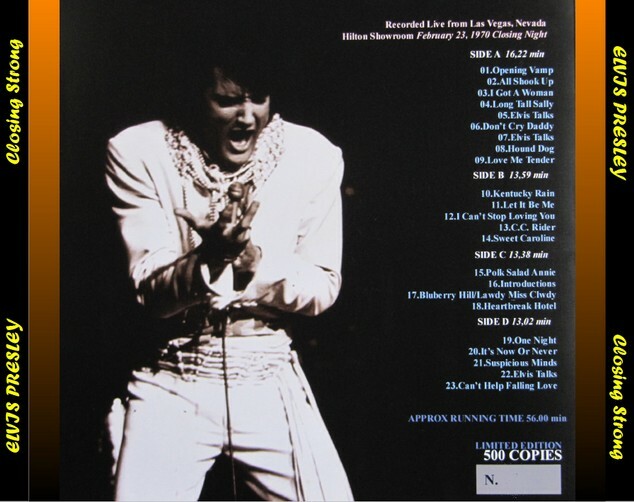 Note: the March 01, 1970 AS was released (by the King Crown Records label ”Elvis at the Dome“ CD, 2001) from an inferior audience recorded source. This CD has nothing to do with VV’s tape version. ’Closing strong” is the perfect companion to the previous “Better than Ever”. The Vegas second season allows Elvis, after paying his debt to the golden past in the ’69 season, to demonstrate his true abilities. We see the best of Elvis in songs that will become the fulcrum of the Elvis show until 1972 Here you can hear the complete opening night. Houston three days later only from the end of the Vegas season, for Elvis the very first opportunity to face a real audience from his comeback to live scenes. The result six supernatural shows with record attendance set in the Saturday evening show…. the rest his history, Here you can hear the complete March 01 afternoon show. Elvis performed accompanied from the band only a solid and rough show singing the best of the previous Las Vegas Season, in spite the short show ( about 44 minutes) and the bad acoustic with this show as Houston Chronicle review suggest “ELVIS BRINGS DOWN THE HOUSE AT THE DOME” can be reasonably to be included in one of best shows ever!!! The DOUBLE LP SET, 200 VINYL GRAM ,33 RPM SPEED, PICTURE DISC!! !IT NEVER SOUNDED BETTER!!! !is a LIMITED HAND NUMBERED 500 COPIES. It comes with an three fold 300 gram high quality GLOSSY sleeve both sides printed, giving an unique view. The sleeve will be accompanied Newspapers clips and with many photographs of the Elvis different suits wore in February. Both the vinyl disc will be for the first time of the label, AN INCREDIBLE TWO PICTURE DISC A REAL COLLECTOR GEM!!!!!!. The CD with the Houston show, will be accompanied with a plain sleeve . We hope you can enjoy this Fourth product in the way to give life to more of his kind in next future.